4th floor flat within a small 6 story building. 800 m from the sea front, Promenade des Anglais, Magnan quarter. Close to all amenities. 10 min from Nice airport (cab or bus). Suitable for 3 adults or 2 adults and 2 kids. Ideal Pied a Terre for people who need to work / check his email while on vacation, or good for visiting the Cote d'Azur. The apartment is well appointed and comfortable and conveniently located. A lot of the local shops were closed during our time there but we got along fine. We really enjoyed our stay. Enjoyed the TV and sound equipment and the TV in the bedroom. Pizza place next door and shops within easy walking distance. very regular every 15 mins , pay one and half euros to bus driver ) The 22 will take you to Jean Medicin the main Nice thoroughfare ,where all the major outlets and cafes are. 60 bus takes you to promenade only then No 8 ( on the same ticket ), will take you to a main street, The Gambetti and possibly to train station ?. For me 77 yrs old it was a little bit to far from the centre of Nice, Dianne 67 however was happy to walk it. The flat is very well kept. Clean with good facilities such as wifi. The area is fairly quiet but it's easy to get into the town centre and is a convenient base to travel around the coast. We hired a car and although the flat comes with a car park space in the basement, we found it easier to park in the free car park across the street. Overall we had a lovely stay here and would recommend it. A fantastic apartment, short distance to the beach, shops, and restaurants. The apartment is modern and with an well equipped kitchen and bathroom . Well recommended! A lovely clean and modern furnished apartment 10 minutes walk from the beach, with a regular bus service minutes from the front door. The kitchen came fully equipped and has a breakfast bar, the bathroom has a fantastic large overhead shower, and there's a fast free wifi connection provided. The apartment has a really comfortable bed - we had trouble getting up! 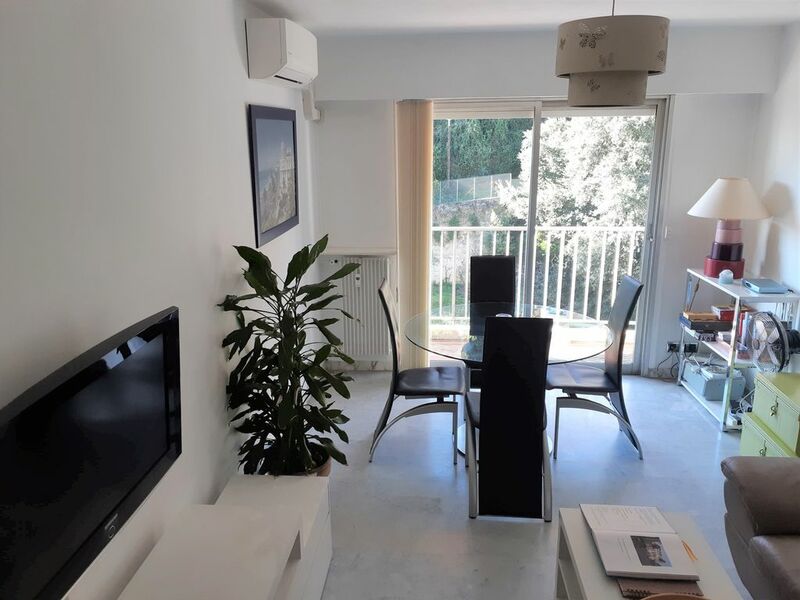 I'd say this apartment makes an ideal base for a short trip to Nice, but would be ideal for a longer stay. Am looking forward to a return stay next year! We just spent a couple of much needed weeks at this fabulous apartment with only one regret: not having stayed even longer! Conveniently located, we spent our days exploring the French Riviera by car and returned to our very fine "home away from home" at night. Sometimes we stayed in and cooked sometimes we went to Veille Ville Nice and took advantage of the night life. Everything was set up to allow us to enjoy our time in the South: guide books galore, lovely decorations and the latest hi-tech equipment (whether it be in the kitchen or in the living room!). We would love to return to this apartment in the future. Thanks so much! The flat is 800 m away from the Promenade des Anglais and seaside. Easy access for the old town (by bus, by pushbike, or walk). During winter time, you can go skiing for a day or more if you want), We are 1 hour away from the Mercantour. Nice slopes. Or in Nice, one of the third biggest Carnival in the world. So many things to do all year round in Nice and the Cote d'Azur. Des arrhes équivalent à 30 % du montant de la location sont à verser lors de la réservation. Le solde et la caution sont à régler au plus tard un mois avant la date du séjour. Les départs se font dans la matinée, les arrivées à partir de 14 heures le samedi pendant l'été. Toute arrivée a partir de 19 heures jusqu’à 22 heures sera facturé 30 euros (à remettre à la personne qui vous recevra).